"It's trial and error, mostly. I begin by recording any idea to see if anything is happening musically, and then we each add our input gradually. For example Roma will listen to the build-up of the arrangement and maybe suggest a title, a theme or lyrics. But because my base is in classical music, what is most important to me is melody. Everything that is added is just an embellishment of that melody, even down to the lyrics. The feelings that I've tried to evoke in the original melody dictates the final shape of the song. So many times we work on a track, like 'Caribbean Blue', and when we find it's not working we strip it right back to basics and reconstruct everything again, even the lyrics. And sometimes this process involves undoing a tremendous amount of work. For example 'Angeles' on the album has approximately 500 vocals on it. And it's as difficult and demanding, each time, to sing multi-vocals as it is to do a lead vocal. On meeting Nicky and Roma Ryan: I was 18 and had studied music and was really feeling my way, trying to see what I could do. I didn't write music at the time but I remember meeting Nicky and Roma, who were working with Clannad, and sensing a lot of ambition there. And towards the end my instinct was 'these two people are going to do something and I want to be a part of that'. " Joe Jackson talks to the singer/composer Enya about her latest album Shepherd Moons. It is somewhat of an insult to confuse the woman Eithne Ní Bhraonáin with Enya, her public persona. Particularly if you perceive her as little more than a Botticelli-like beauty so fragile that you fear she will break if you breathe too harshly in her presence. To see her only this way is to burden her, as many in the media do, with the label of other-worldly pop goddess. No doubt this is a persona the intensely shy 30-year-old Donegal-born woman uses to her advantage, in interview situations, and in marketing her tightly controlled image, but in truth this creature known as Enya is less a single entity than a triumvirate comprised of vocalist/composer Ní Bhraonáin, studio-wizard Nicky Ryan and lyricist Roma Ryan. And this triumvirate has just released Shepherd Moons, a follow-up to the phenomenally successful album Watermark which sold four million copies worldwide and has just re-entered the charts as a result of Enya's latest hit single 'Caribbean Blue'. Sipping tea in a Dublin hotel on Sunday morning that is decidedly Irish-grey, Enya describes the creative processes involved in composing the songs from Shepherd Moons. "It's trial and error, mostly. I begin by recording any idea to see if anything is happening musically, and then we each add our input gradually. For example Roma will listen to the build-up of the arrangement and maybe suggest a title, a theme or lyrics. But because my base is in classical music, what is most important to me is melody. Everything that is added is just an embellishment of that melody, even down to the lyrics. The feelings that I've tried to evoke in the original melody dictates the final shape of the song," she says. Pinpointing the painstaking effort that goes into creating each individual song, Enya highlights the role played by technology. "So many times we work on a track, like 'Caribbean Blue', and when we find it's not working we strip it right back to basics and reconstruct everything again, even the lyrics. And sometimes this process involves undoing a tremendous amount of work. For example 'Angeles' on the album has approximately 500 vocals on it. And it's as difficult and demanding, each time, to sing multi-vocals as it is to do a lead vocal. "I usually begin by harmonising with the main melody, then Nicky will put that vocal to my left ear and we'll do it maybe 20 times until a new sound evolves from that musical line. Then I begin to layer it with harmony and each time I sing it drains me completely emotionally. But because I play a lot of keyboards, a song often will get very linear so layering vocals is the main human element we can incorporate into the music. That's why vocals are so important to me," she explains. 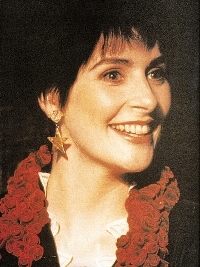 Enya suggests that much of the music she creates -- "particularly those melancholic melodies" -- is rooted in the soil of Ireland, specifically in Co. Donegal where her family still lives. However, if she is the youngest daughter of the clan that also gave the world Clannad, Enya prefers to trace her own musical evolution from the time she split from the group, rather than the years she spent with them. "But then I wouldn't call what happened a 'split' because I wasn't really a full member of Clannad. I always felt I was just passing through," she says. "I was 18 and had studied music and was really feeling my way, trying to see what I could do. I didn't write music at the time but I remember meeting Nicky and Roma, who were working with Clannad, and sensing a lot of ambition there. And towards the end my instinct was 'these two people are going to do something and I want to be a part of that'. And the point is that Clannad, in the end, were very unhappy working with Nicky and Roma and that caused a lot of problems. But I chose to go with them." Statements like this fuel suggestions that the Ryans then proceeded to exercise a Svengali-like influence over the young Eithne Ní Bhraonáin, particularly Nicky Ryan who, some claim, had already reshaped Clannad's sound to accommodate his own musical vision. Did Ryan similarly influence Enya? "He has a lot of influence, musically, yes," she replies unhesitatingly. "He always had. No matter who he was working with. So yes he would have had a lot of input into Clannad and very much the same with regards to me. Yet it wasn't that he imposed anything on me in terms of his musical vision. It's more a matter of compromise because musically there are two people involved. And I'm very strong, musically, because of my classical training. And the fact is that I do write the melody and in that melody are, as I said earlier, feelings which I want to have retained all the time. So that's where we argue a lot," she says, smiling in a way that suggests that a battle with Eithne Ní Bhraonáin could be quite a bloody affair. Her decision to leave Clannad, and home, and move in with the Ryans also created a rift in the closely knit Ó Braonáin family. Enya admits, "the fact that I didn't choose to stay clannish with the family did cause problems, yes. But when you go to boarding school at 11, as I did, you tend to become very independent. And I've always been a very strong, very stubborn person. And the fact is that I had become very friendly with Nicky and Roma. I trusted them. And, basically, I felt there was more there for me career-wise," she says. Long-standing rumours that Enya had become more than just "friendly" with Nicky Ryan were aggravated by the fact that she began living with the Ryans. Immediately after this interview, Roma Ryan acknowledged, and rejected these rumours. Enya explains: "The reason I moved in was because I had no money. Where was I going to go to live?" she asks, rhetorically. "But I think those rumours will never go away because people will always say 'wait a second -- there is a story here -- why did she do that?' But the point is that it was a difficult decision for me, I did it and I really don't want to say any more about that. It was so long ago," she smiles. But Enya admits that people are bound to be interested in her private life. Particularly when they continually read about her "hermit-like" existence, spending ten months of the year in the Ryan's studio, shunning all other relationships, including romance. "Those stories were exaggerated," she says. "I'm not a hermit for my art! I have a social life, I have friends and we do take a break from the studio now and again! But the fact is that musically I do have to close myself off from the world to work on an album. And if I'm in a studio in London, for example, how many men will I meet there? "Besides, when I'm working I don't look on someone as a man. He's only there working with me and it's important that nothing interferes with my work. Not that the work is more important than relationships. Not anymore. But it was. In 1989, when I was recording Watermark I felt if I was to sit down and even think 'I am attracted to that man' it would influence my work. I was very hard on myself. But the difference between that album and Shepherd Moons is that I've mellowed," she says. Part of this mellowing process, claims Enya, is that for the first time in her life she is willing to contemplate thoughts of marriage and of having children, particularly the latter now that she is 30. "I would be aware of the pressures that can be put on women to have children by this age," she says. "And certainly from Watermark onwards I have been seeking more for myself, personally. I've felt there has been more time for this because up to then I was convinced that if I was going to make a success of my career I'd have to dedicate a lot of my time to doing that. But with the success of Watermark and, hopefully, Shepherd Moons I can take a little more time to myself..." She pauses, then laughs..."Discipline myself to get out, and stay out of the studio!" Note: Transcribed by Tracey S. Rosenberg and posted to alt.music.enya 19 August 1993.